Come for a thrilling vacation on a real working ranch. 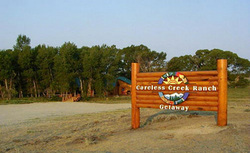 Careless Creek Ranch Getaway is located on a family operated 48,000-acre sheep and cattle ranch just south of the Big Snowy Mountains in central Montana. While trailing cattle on your horse, catch exciting views of the mountains, wildlife, old homesteads, native plants, and wildflowers. Relax in country quiet on the deck, go hiking, fishing, or horseback riding. Witness breathtaking sunrises and sunsets from the porch of our log guest lodge nestled in the cottonwood trees along Careless Creek. Our handicapped accessible lodge has a great view of the prairie and mountains and has a full kitchen and guest laundry. The main lodge, with a half loft, sleeps 6. The private Bison and Branding Iron rooms sleep 4 each. For a step into the past, our original sheepherders wagon sleeps 2. Directions: From Harlowton, Montana, go east on US Highway 12, 16 miles to Shawmut. Turn left on MT Highway 297 going north 9 miles to road T. Turn right, go east 0.5 mile. Turn left, go north 0.5 mile. Careless Creek Ranch Getaway lodge is on the left, nestled in the cottonwood trees along Careless Creek. The lodge is 80 miles from the city of Billings, 130 miles from Great Falls, 120 miles from Bozeman. Yellowstone Park is a 2 hour picturesque mountain viewing drive away and Glacier National Park is a 4.5 hour scenic drive through Montana 'Russell Country'.